I accidentally managed to watch the whole thing too. I'm not usually a fan of showing too much skin, but I thought Kelly Rowland looked absolutely fabulous. love the skirt! too cute! I love the mix of print and texture here! That shirt is absolutely gorgeous, and fringed booties are the greatest! I think my favorites of the night were Rihanna, Taylor Swift, and Janelle Monae. I love this outfit!, I missed the Grammys, but I love hearing all of the recaps! Your skirt is very beautifull! Sadly I missed the Grammy's - was on a Dexter kick :) Loving your bangs - seriously, you have the best bangs! 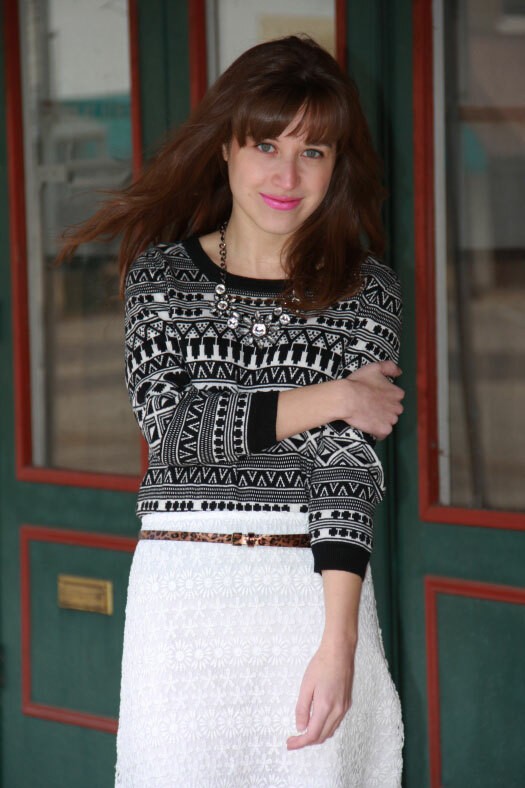 I love the pattern on this top- and black and white is so "in" right now, too! Loving the skirt very much!! Giveaway on the blog to win a $15 credit to Stella and Dot!! I didn't watch it. I don't even know what music is popular anymore! I'm definitely turning into an old person. LOVE this skirt! So cute girl! You look so adorable here...and your bangs rock! I love the print on the top, and that skirt is gorgeous. I am digging this black and white combo – the lace plus the pattern plus the fringe on your boots works so well! Love this outfit! You look adorable and I love the touch of pink lipstick! Loving the lipstick and statement necklace. They make this outfit pop even more! I love lace skirts. I think they are so feminine. Yours is so pretty and it looks amazing with the black and white sweater. You look so pretty and chic in this outfit! I'm really in love with your skirt, it's so lovely, feminine and glamorous! You look amazing! Such a beautiful outfit, and I'm so jealous of your hair as well! I'm loving that lipcolor on you--what is it??? I'm really liking the combination of that beautiful skirt with the patterned sweater. So cute! Absolutely LOVE this outfit! I can't stop obsessing over winter whites and you styled this perfectly. Thank you for visiting my blog and for your sweet comment. Following you on bloglovin now! Cute outfit! I love that skirt...it's so stylish! That sweater is SO cute, and I love those boots! Thank you for your sweet comment on our site! Love your outfit. Great sweater, the print is gorgeous! I'm obsessed with fringes ! Cute boots ! Love that skirt! I need it for spring! Girl you have great style! I can't believe I am just coming across your blog:) I love it! What a fun combo! I'm lovin this skirt! This outfit is So cute and I love that you added a pop of color through your lipstick! Such a fun skirt! Love the hemline detail, G! loving that skirt! so cute with the booties. ps. loving the rebranding!